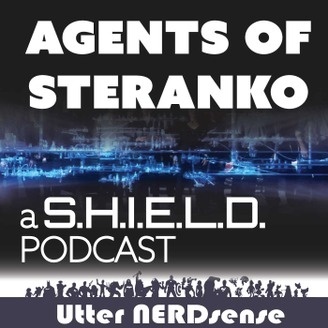 Here at Agents of Steranko we are recapping each weeks episode of Marvel’s Agents of SHIELD. Fireworks are going off on Marvel's Agents of SHIELD episode 404 "Let Me Stand Next To Your Fire". Daisy teams up with Simmons as they investigate how the Watchdogs are tracking the Inhumans. Their trail leads to James, aka Hellfire, and fireworks ensue when Robbie Reyes Ghostrider joins the hunt. Check out the podcast below and show notes after the jump We love to hear from you. Join the discussion on our Facebook group https://www.facebook.com/groups/utternerdsense/ You can leave us e-mail feedback through feedback@utternerdsense.com You can find all our shows at http://utternerdsense.com/ Follow us on twitter Updates: @utternerdsense (https://twitter.com/utternerdsense). Jay: @dreamjae (https://twitter.com/dreamjae) Help us out! If you enjoyed the show, you can really help us by subscribing and giving us a rate and review on iTunes. 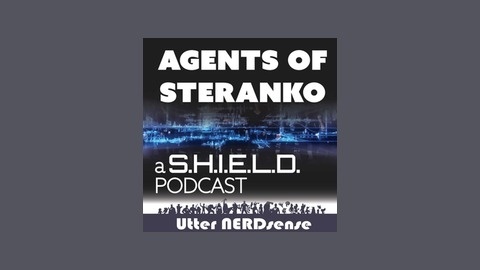 You can find our Marvel’s Agents of SHIELD podcast on iTunes at https://itunes.apple.com/us/podcast/agents-steranko-agents-shield/id981784888?mt=2 You can also find our Once Upon a Time podcast at our iTunes feed https://itunes.apple.com/us/podcast/happily-ever-after-once-upon/id981785085?mt=2 You can also check out our UtterNerdsense Network feed that includes Once Upon a Time as well as our other podcasts, such as Agents of Shield, at https://itunes.apple.com/us/podcast/utter-nerdsense/id955625598?mt=2 Marvel’s Agents of SHIELD stars Clark Gregg as Director Phil Coulson, Ming-Na Wen as Agent Melinda May, Brett Dalton as Grant Ward, Chloe Bennet as Agent Daisy Johnson, Iain De Caestecker as Agent Leo Fitz, Elizabeth Henstridge as Agent Jemma Simmons, Henry Simmons as Agent Alphonso “Mack” MacKenzie and John Hannah as Holden Radcliffe. Season 4 of Marvel's Agents of SHIELD airs Tuesdays at 10 on ABC.